Kim Jong Un waves upon arrival by train in Dong Dang. NORTH KOREAN LEADER Kim Jong Un and US President Donald Trump have both arrived in Hanoi ahead of their second summit, but the exact location of their meeting is not yet known. The summit is shrouded in secrecy and even as Trump touched down this afternoon there was no official word even on the venue. The two leaders are expected to have an informal dinner on tomorrow before more formal talks on Thursday. The arrival of both leaders created a great stir, with Kim embarking on a two-and-a-half day, 4,000 kilometre odyssey through China by train. Trump’s travel was more conventional, flying on Air Force One in a journey that included a refuelling stop at an RAF base in the UK. In Hanoi, there was some confusion when it was realised that the hotel Kim was to stay in had been double-booked, with the White House press corps also set to be staying in the city’s Melia Hotel. When security started to tighten at the hotel yesterday, reporters were in disbelief that the western press corps was going to be amassed at the same place as the reclusive North Korean leader. It was unclear who booked first but Vietnam’s Foreign Minister said today the journalists were to be relocated to an international media a seven-minute walk away. This second summit will be watched closely for concrete steps that Pyongyang is to dismantle its nuclear programme. Kim’s epic journey to Vietnam ended at the normally sleepy border station of Dong Dang, where he was met by a military guard of honour in pristine white uniforms. They presented arms as he strolled down the red carpet waving and grinning, surrounded by a phalanx of aides and security personnel. Student Nguyen Thu Uyen who handed Kim flowers on his arrival said meeting the leader was her “most memorable” moment. 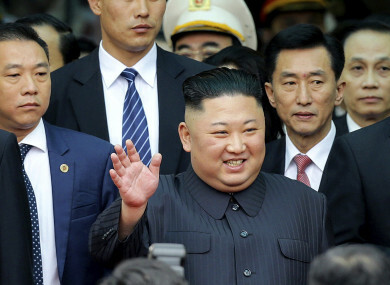 “Kim Jong Un is very friendly and especially attractive,” she said, after Kim became the first North Korean leader to visit fellow one-party state Vietnam since his grandfather Kim Il Sung in 1964. Kim was greeted in Hanoi by cheering crowds and after a few hours’ rest at his hotel, made a 50-minute jaunt to the North Korean embassy — echoing the summit in Singapore, where he took in the sights on an unscheduled sortie. But Pyongyang sees denuclearisation more broadly, seeking an end to sanctions and what it sees as US threats — usually taken to include the American military presence in South Korea, and sometimes in the wider region. Email “After 4,000km trip that included a smoke break in China, Kim Jong Un arrives in Vietnam by train ”. Feedback on “After 4,000km trip that included a smoke break in China, Kim Jong Un arrives in Vietnam by train ”.